Look at her hair. Whoa Nelly. He he, this is fun! I laughed so hard when I saw her. 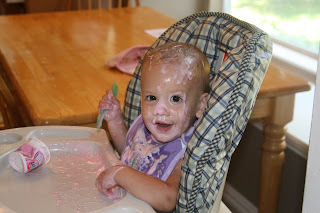 And she was as happy as can be....until she rubbed her left eye and got some yogurt in it. 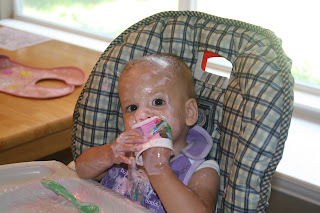 Then she rubbed again to get it out- thus putting more yogurt in since her fingers were covered in the stuff. So, it was fun while it lasted:) And, of course, it made for some great pics and a funny memory.... and a great blog post. I love this post. I just laughed and laughed and so did Tata. Thanks for sharing this it was too cool and cute and oh so messy, bet the clean up was a lot of fun. Hey maybe she's come up with a new facial. We are still laughing. Too cute. a facial and a new styling gel-he he. who knew yogurt had all of these benefits? well, cali did. She's so sweet, but then you already know that! Ahh, but it would be nice sometime to just abandon all of our hangups and just be like a child! ok, i do the SAME thing. we think they are older than they are and can handle bigger and better things, like sippys with no lids..... so heres to the days when they are old enough and finally can. and yes, she is SO precious! I LOVE IT. Isn't yougurt good for your skin anyway? In a salon they would have charged you $45 bucks for that "Creamy face mask". I love the pic with her arms in the air. 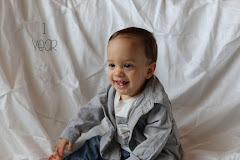 And I love how blogging makes us nicer mothers. 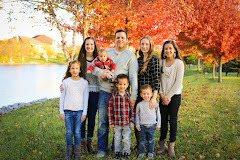 It has saved my kids from much yelling becuase I think it makes for a great post :O)! hey---that little person knows EXACTLY what she's doing!! totally adorable. 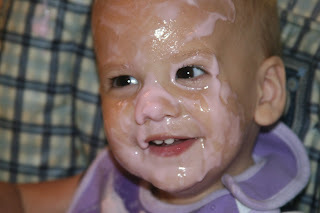 Hey if my face could look that good I would use yogurt for a facial too... maybe I should try it....uh...no...I think I'm beyond the facial helping stage. Oh, I laughed so hard when I saw this. That's the cutest little yogurt covered drop I've ever seen. That is so funny!! 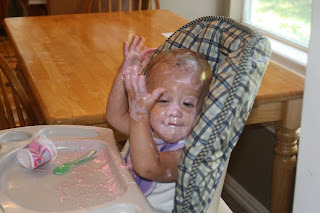 she sure does look like she's getting a yogurt facial! Adorable! so cute. 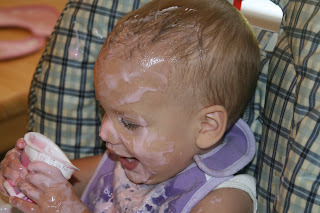 Didn't you know that yogurt makes a great facial! Whoa. So messy and yet so cute! 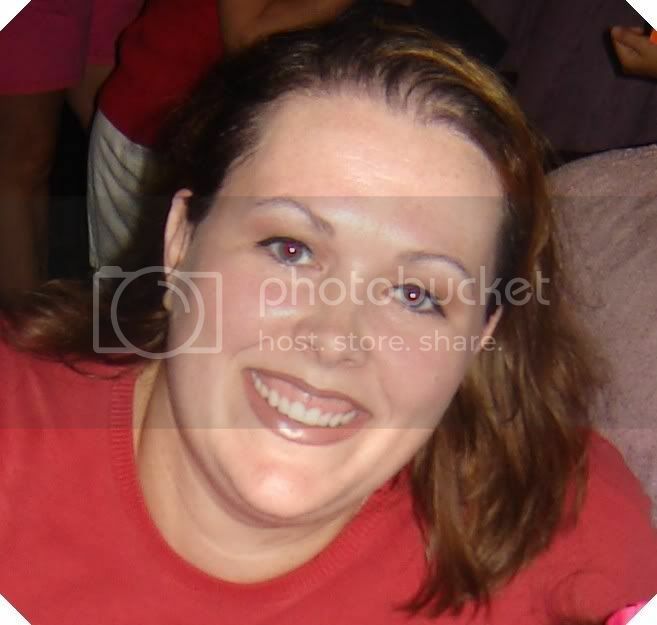 Oh my, those pictures crack me up...what a cutie!! 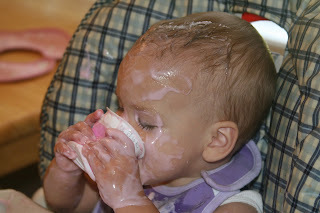 The crazy thing is: that's what I look like when I eat yogurt!!! Go on with yo bad self, Cali!!! I LOVE these pics of Cali. I wish I could have seen it in person. Holy cow! That girl loves her yogurt! I am sweating and getting the shakes looking at those pics. I don't do messes well. EEK! oh man! this is HILARIOUS!!!! so flippin cute. That does look awfully messy. How long did it take you to clean it up? Yep - match made in heaven!